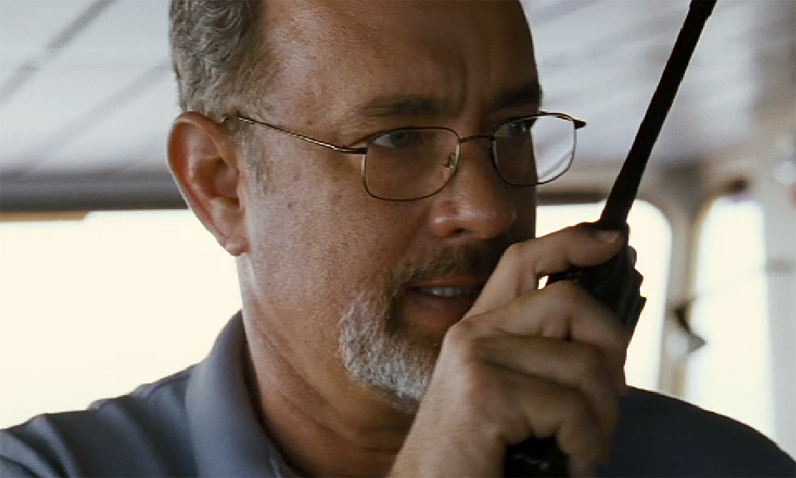 The film is Captain Phillips, directed by Paul Greengrass. The screenplay is written by the talented Billy Ray based on A Captain's Duty: Somali Pirates, Navy SEALS, and Dangerous Days at Sea by Richard Phillips and Stephan Talty. Richard Phillips was born and grew up in Winchester, Massachussettes. When he graduated from highschool he enrolled in the University of Massachussetes to study international law, but instead ended up transfering to the Massachussetes Maritime Academy where he graduated in 1979. In 1987 Phillips married a nurse, Andrea Coggio. They had two children Daniel and Mariah. In 2009, at the age of 53, Phillips was Captain of the Maersk Alabama when it was hijaked by Somali Pirates. The cargo ship, with it's 20 crew members, was hijaked on April 8, 2009. 4 Somali pirates boarded the ship and the crew was able to sink the Somali pirates speed boat. Captain Phillips allowed his crew to be safe while he was taken hostage on a lifeboat during the exchange. After an agressive standoff, Phillips was rescued on April 12, 2009 by Navy SEAL snipers who took out three of the four pirates, and took the fourth into custody. Phillips wrote the book A Captain's Duty shortly after his rescue, and it was published the same year. The film Captain Phillips is an action-filled biopic that deals with the Maesk Alabama hijaking. Tom Hanks will play the title role, while Catherine Keener plays his wife Andrea Phillips. The rest of the cast portraying the four Somali Pirates, the Maersk Alabama crew, and the Navy SEALs are relatively unknown performers. The film will feature a performance by Yul Vazquez as Captain Frank Castellano. Castellano was the Navy commander of the guided missile destroyer the USS Bainbridge that was instrumental in April 12 rescue of Captain Phillips. Chief Engineer Mike Perry will be portrayed by David Warshofsky. In what could be a big year for Tom Hanks return to the big screen in some high profile films, it's anyone's guess as to how critics and peers will view Hanks performance in this film. Will Tom Hanks receive praise, including an Academy Award nomination for his performance as this Real (Reel) Person? Very well done, and realistic situation compared to the majority of movies out recently. Would watch again when it gets cheaper. I am continually amazed at Tom Hank's ability to bring such depth and complexity of character and plot to the screen. This film is truly amazing to watch. Every character in this film is excellently played. I really liked the interview with the authentic Captain Phillips and his look on his job and the continual life-threatening occurrences on the high seas. I really liked the fact that this film opened your eyes to life one doesn't know much about.